Think about it; what happens to your encrypted data, your online accounts, your pictures, your digital-whatever if for some reason you're not around to access it? Continue reading: "What happens when I die?" I have [a lot of applications on my desktop}. Would my desktop load faster if I put all of these apps and utility programs into one desktop folder rather than having all the icons appear on my desktop? Seeing them doesn't bother me and my desktop loads pretty fast, but my kids are horrified by all they see on my desktop. They say that even though these apps are not listed in my Startup Menu or in Start Programs and even though the apps don't appear to be running in Task Manager processes, they are running and using valuable CPU. Can you enlighten me and my kids? I'm with your kids, sort of. I'm horrified, but not for the reasons that they're horrified. And even though I am, if I were you I'd likely not change a thing. I know that seems like contradictory advice, but it all boils down to being a matter of taste, and nothing more. Continue reading: "Do icons on my desktop mean programs are running or will they otherwise slow down my system?" Why is Internet time four or five minutes ahead of Network TV time? I set my VCR according to my computer and recordings are late to start and last too long. Had to put it back the way it was. My experience is actually the opposite of yours - a couple of networks seem to "run late" and I end up missing the crucial last minute or two of shows from time to time. So I can't speak for the TV networks, other than to suspect that some simply don't do time very well, perhaps intentionally or otherwise. But we can look at your computer and this concept of "internet time". Continue reading: "Why is my PC's clock wrong?" I've looked in my "windowssystem32driversetchosts" file and found a number of entries that all begin with 127.0.0.1. 1. What are all those identical seemingly IP addresses, 127.0.0.1? 2. The sites listed, are they on my system and bad or are they being blocked from my computer to reach them (just like what you had stated Sasser, sometimes does to reach Anti-virus sites for definition updates? 3. What should I do with this list? Shall I delete these sites and only keep the localhost line? 127.0.0.1 is "special", and refers to your own computer. It's used for both good and evil. The trick here is to understand which, and perhaps how these entries appeared on your computer in the first place. Continue reading: "What are these 127.0.0.1 entries in my system hosts file?" I read your newsletter every week. One of the applications you mentioned was TweakVI. I downloaded the free version and tried it for a while. In all such situations, if I like the software, I try to patronize the developer by purchasing some commercial version of the product. The commercial version was a disaster. You never endorsed the application and I don't expect you to be the Better Business Bureau. I just wanted you to be aware of a potential issue. If you don't hear any more stories like this, then I guess you can dismiss my problem as a fluke. However, I suspect other people are in the same boat. I truly sympathize with your plight. Regardless of how good a product may or may not be, it's going to fail to meet someone's needs or expectations eventually. Apparently, that was the case here, and it sounds like it wasn't handled well by the company producing TweakVI either. But there's another problem here as well that is worth understanding. I've never recommended TweakVI. In fact, until I received your email, I'd never even heard of it. Continue reading: "You may want to rethink your recommendation of this product I had problems with." Every time I open Outlook it tells me that it was not closed properly and the data file is being checked for errors. How do I correct this issue? Exiting Outlook didn't always exit Outlook. Continue reading: "Why does Outlook tell me it wasn't closed properly?" For those of you who are not as neat as Leo, and like to fill your desktop with tons of files and other stuff, there is a quick and instant way to get to your desktop. That means press the the windows key + D.
It will instantly show you the desktop, and you can then click your programs and files there. Press Win+D again to return to the program you were originally working on. Otherwise if you are a neat freak, then you are better off following Leo's example! Most users aren't stupid. They're just not as savvy as we think. And they shouldn't have to be. The Myth and the Truth of the IP Address Tracing. OK, so I'm just not sure what to do with this one. Laptop stickers are pretty cool, and you'll often see them all over - sometimes laptops are totally plastered with 'em! (And most, I have to add, are coming from StickerGiant :-). Turns out they're an inexpensive way to promote something. 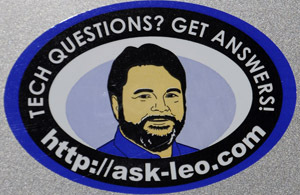 So yes, my laptop, my wife's laptop, and in a few minutes now that I think of it, my wife's employee's laptop will all have Ask Leo! stickers. So what am I not sure of? How to get them to you. I'd love to be able to send a few stickers to anyone who wanted them, but to be honest between the work and the postage, I can't take that on. So I'm not sure what happens next. If you see me in person, by all means, ask for one - I'll usually have a few on me. But otherwise - well, I'm thinking about how to do it. If I come up with something, I'll letcha know. (On a similar note, if you have ideas, let me know :-). And one last blatant plug for my friends at StickerGiant: not only do they do custom stickers in a wide variety of styles, but they've got an incredible inventory of ready-to-purchase stickers, buttons and more that span all sorts of topics from political (incredibly popular right now) to humorous to in-between.